Get Ready for Spring with what’s new, now and necessary in every woman’s wardrobe. 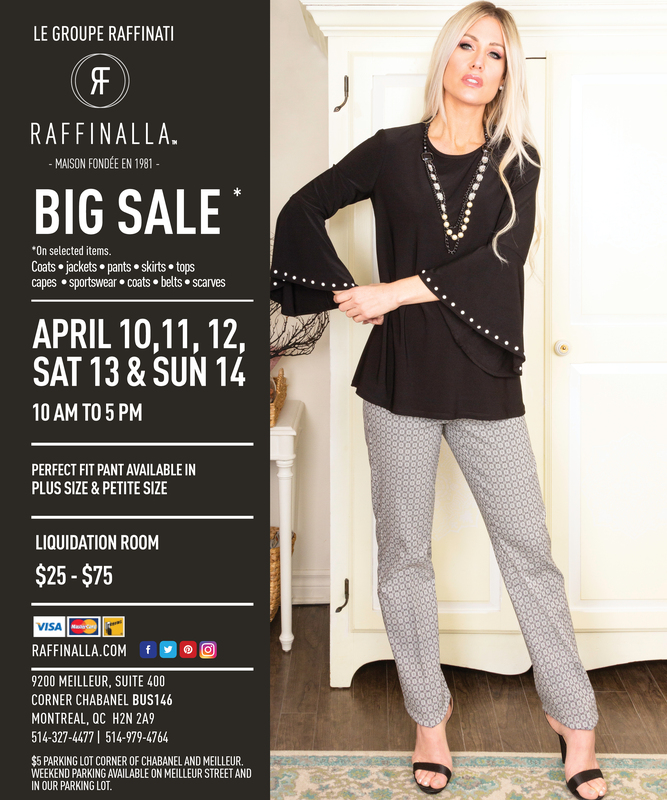 Now’s the perfect time to re-fresh your attire for a new season and to shop for modern, luxurious Spring fashion styles for women at Raffinalla’s Big Sale. The brand offers a full line of impeccably designed women’s clothing. Timeless and flattering, including women’s outerwear, blazers, skirts and tops, a wide variety of pants that are perfect for every occasion, including their famous Perfect Fit Pant and Comfort Fit Leggings. Women from petite to curvy can shop for fashion samples and overstock as Raffinalla lines are available in all sizes. Save up to 80% off on selected merchandise. Perfect Fit Pant starting at $25, tops $15, skirts $25, jackets $35, quilted coats $75, scarves $25, belts $5. So don’t miss the Liquidation Room. This entry was posted on Monday, April 8th, 2019 at 3:20 pm	and is filed under Clothing, Sale, Sample Sale. You can follow any responses to this entry through the RSS 2.0 feed. Both comments and pings are currently closed.